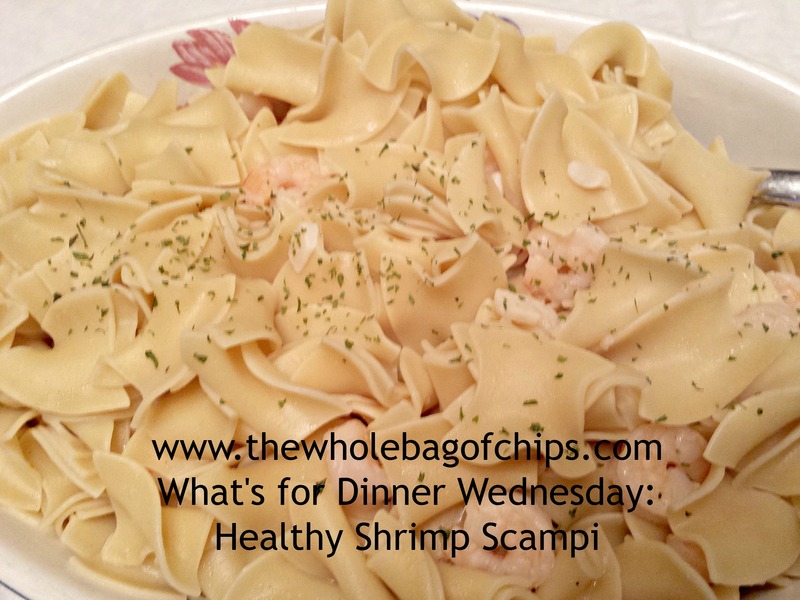 This was a great alternative scampi recipe for our family! I know I say it all the time, but I just love all the recipes that come across my Facebook page every day. I’ve gotten so many great ideas just by my daily scrolling. Today’s recipe is one such recipe. The only down side is I can’t remember who shared it! I know it was on Facebook though and it says it was from the Prego & Mommy Facebook Page. That’s not a page I follow, so someone definitely shared it and it appeared in my feed. The thing that appealed to me about this particular recipe for Shrimp Scampi was that it specifically stated that it did not use any butter. We have issues with butter here, and anything too buttery makes some of us sick. I substitute with “I Can’t Believe it’s Not Butter” pretty often, but when I saw that this recipe had no butter at all, I decided to give it a try. I’m glad I did! It got thumbs up from all who tried it! I’d definitely make it again. The thing I liked about it too, was that you could make it as lemony as you wanted it to be (or not to be) by adding additional lemon at the end. I followed the recipe just as it read, other than one change to the type of shrimp I used which is noted below, and I served it with wide egg noodles. Anyone who didn’t want the shrimp could have plain pasta if they so desired. There was just enough left at the end of the night that I could have it for lunch the next day, too! I love it when that happens. ← Monday Musings: Where’s the page in the books for *that*?? I’ll have to try this – it sounds like something my daughter could eat without any trouble. Thanks!